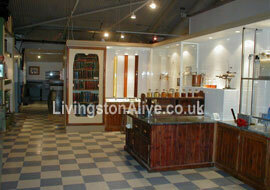 Almond Valley Heritage Centre at LivingstonAlive.co.uk. Mill Farm in Livingston combining with the Shale Oil Museum of Scotland and the Heritage Centre. The Almond Valley Heritage Centre, which incorporates the Livingston Mill Farm is the official museum of the Scottish Shale Oil Industry but it has a lot more than just that. The Museum, which is the first place you enter after you go through the door tells visitors about the build up of the West Lothian area and James "Paraffin" Young's Shale Oil invention. The Museum is full of attractions such as a short mine for you to walk down, Interactive games, computer programs and also several information boards as well as a Hands-On experience. The Museum is the gateway to the Livingston Mill Farm, which until the late 19th century was a working mill & Farm creating flour for local producers and the farm for growing the wheat & grazing animals. The Mill was found in a state of disrepair in the 1960's and was restored by a group of local historians, enthusiast and volunteers. During the 1970's the original Water Wheel was repaired as was the original grinding equipment powered by leather-belts which were powered in turn by the waterwheel which moves with the water from the River Almond. The Mill Farm has other attractions such as visiting the Water Wheel, visiting all the animals and maybe even getting to feed them. It also has a large children's play area, there are Tractor Rides and now there is the Almond Valley Railway taking you from just outside the Museum to the far end of the farm land where you can see lots of Animals, the River Almond and other attractions. 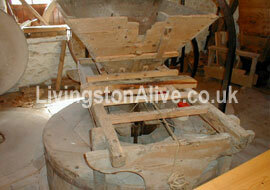 The estate the Mill Farm is on is the original site of the Livingston Mill with its original buildings, original wheel, original butter house, original mill etc. 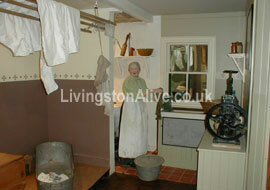 The Almond Valley Heritage Centre is a must see for all visitors to West Lothian and especially visitors to Livingston. 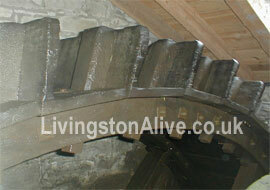 Photos Taken with the kind permission of Dr. Robin Chesters of the Almond Valley Heritage Trust.